While you might take something away from the chart images, I think the greatest value comes through thinking about how you let an early loss affect your mindset. It's one loss. Granted, it's starting off your session, which is never nice. But it's one loss. Trading is a business of success over a series of trades. Implied within that statement is the fact that there WILL be losses. So you need to learn to not only accept them, but also to manage your mindset so that they do not lead to a meltdown in mindset and P&L. Use a FIRST LOSS as a trigger to REFOCUS. Make sure you're breathing slowly and deeply. Mind clear, body relaxed. Reassess the trend and project forward. Where is the next opportunity. Now FOCUS. We're going to make sure this is an A+ trade. This doesn't mean the next one will win. But regardless of whether it wins or loses, your aim is to make it one you'd be proud to place on your wall as a perfect representation of your trading plan. Now, the obvious objection to this is the fact that EVERY trade should be approached in this manner. And that's fine. I agree. But the reality is that we, as human traders, do not always bring that degree of focus and situational awareness to the game. Use the first loss as a trigger to check yourself. Check your focus. Check your awareness. Check your commitment to excellence in managing the risk and opportunity that is coming in the next sequence of price movement. 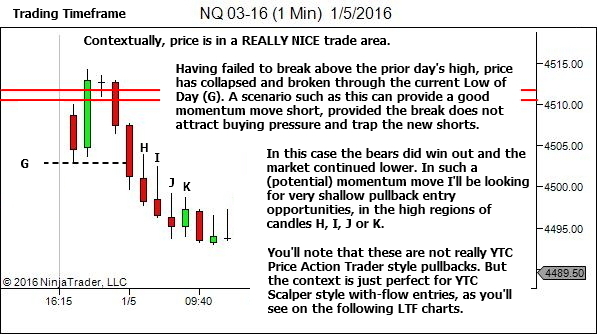 Two failed trade ideas in a row (not full losses) – I'll consider skipping this setup area and just letting it go. 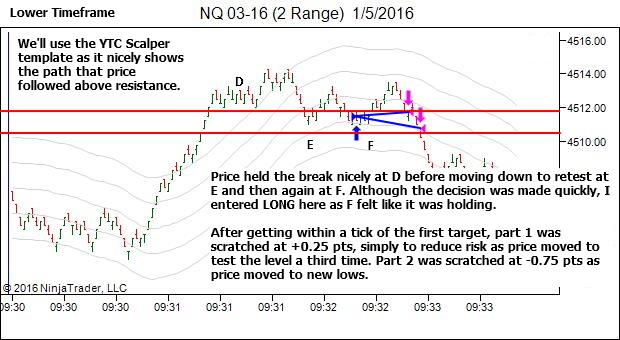 Three failed trade ideas in a row (not full losses) – I'm definitely moving on to the next setup area. I'm not in sync with the market. Let it go. Two full losses in a row – Timeout. Get away. Refresh, relax and come back later with a clear mind. Take some time out to consider how you typically let an early loss affect your mindset. Does it often lead to frustration and disappointment? Does it often lead to a meltdown? Could you add value to your business by considering a more positive "first loss" trigger and action? 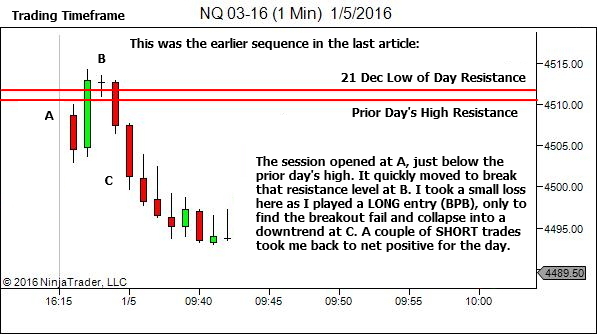 Our primary aim as traders is ALWAYS to ensure we survive to trade another day. To achieve that, we can't let a single loss propel us into a spiral of angry revenge-trading. Manage your mindset! Make the next trade one you'll be proud of, regardless of whether it wins or loses. 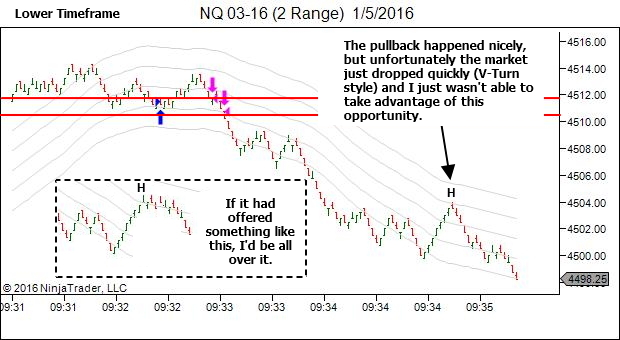 You might also like to use "dumb trades" as a trigger to refocus, aiming to follow them up with another A+ performance. Give it a try. 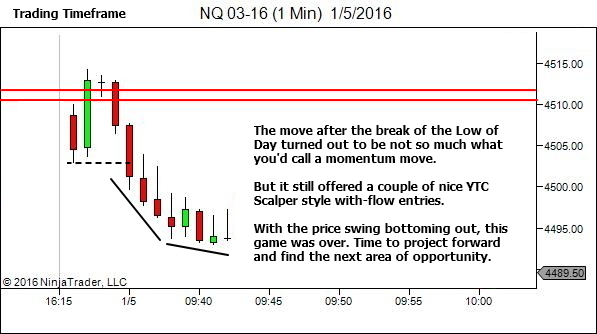 Lance, what made you decide to focus on NQ? How do you know when to move on from a symbol and focus your efforts elsewhere? 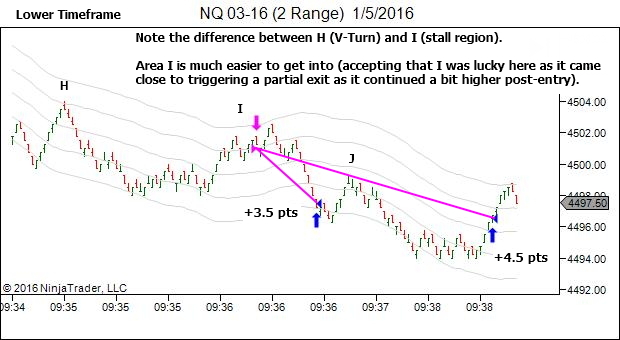 I imagine it might have something to do with CL or TF not properly showing you the stalls at turn areas as you’d like to see on your range charts. No good reason mostly. Just restless and needing change. 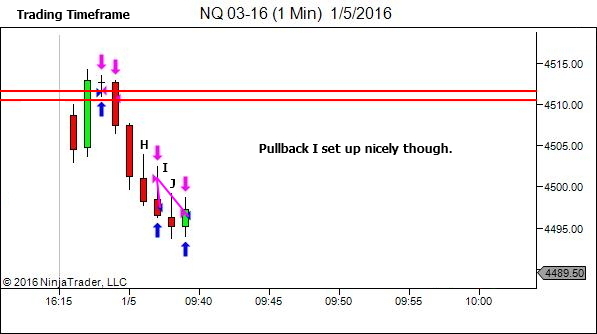 I had never seriously traded NQ till recently but it’s fast become my favourite emini contract. I just love the pace and smoothness of price movement. But CL, TF, YM, NQ are all fine. There is no “best” market, just what suits you and your style of trading. This is the reason ES is off the list. Many traders love it. It just doesn’t suit me (too slow, thick and lethargic in its price movement). 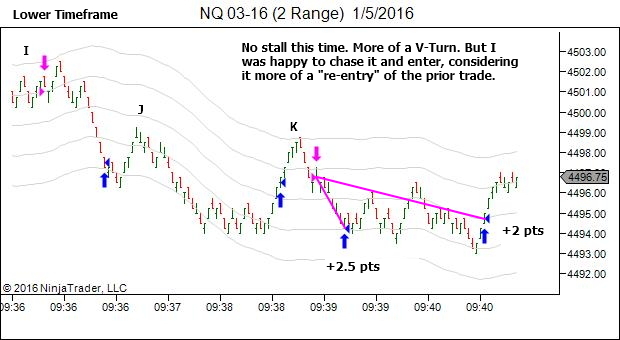 The “stall at the turn” on range charts is not an essential feature of a pullback. Adjust to suit the nature of each instrument. Some provide this at times. At other times the pullbacks will be more the v-turn variety. 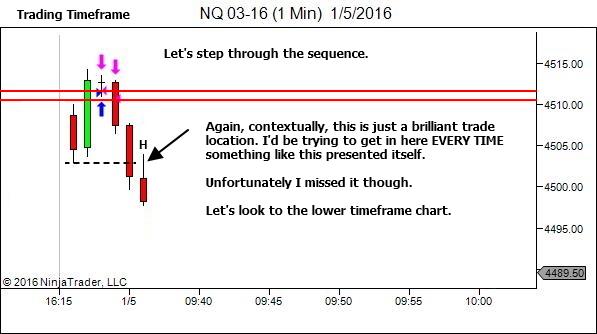 Read the market and adjust to suit the context. I was wondering how do you choose a trading instrument, As you said it is very important for a scrip to move nicely to be able to trade . 1. 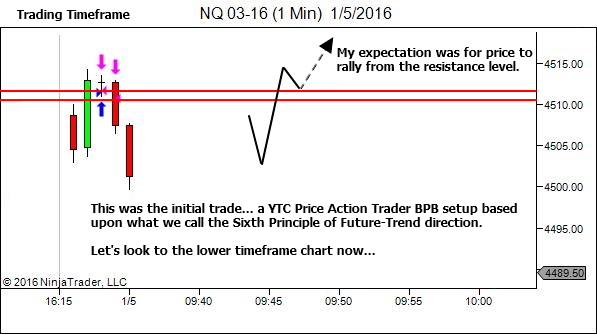 Is there any minimum ticks per min that you wish to have in a scrip to trade ? 3. which trading platform do you use ? 1. It’s just a matter of trial and error. Spend a few days on all instruments that are of interest to you, in order to get a feel for the pace, directionality, volatility, liquidity, thickness etc. All markets have their own personality. It’s a matter of finding the best fit for you and your style of trading. 2. (a) It needs to show the detail “inside” the TTF candle. 4 or 6 range would not always do that. (b) It needs to be the right pace – not too fast that I can’t keep up and not too slow that I get no feel for sentiment. Again, trial and error.